I had an idea that I should re-shape my mind to focus less on striving for romantic love, and more on the sweetness of God. In pursuit thereof, it seemed beneficial to form new habits, which would give a different cast to my mind: reading Scripture every day (less sporadically), praying more regularly, avoiding certain haunts on Tumblr and Ao3, and reading some devotional work or poetry (beginning with The Imitation of Christ by Thomas a Kempis). The poetry that first came to mind was the product of a Facebook friend. She’s more of an acquaintance after we’ve spent so many years in different places, yet I would delight in any time spent with her. While I don’t wish to follow her footsteps exactly, her life’s path struck me as a useful exemplar: a woman who reads widely, writes beautifully, has never seemed concerned with Eros in her life, and who has discerned a vocation as a nun. I set out to capture her poetry (lest she remove it one day from Facebook) and, along the way, also captured her quotations: a sort of vade mecum, even if it was originally hers and not mine. Well, obviously I fell prey to envy once again. Not merely over her reading and writing, her photography, or her understanding of the world, but her graduate degree, the time she spent growing while teaching, and her friendships: lively and verdant and close, full of delight and encouragement. I was also envious, during this process, of my past self’s relationships and pursuits, wishing I’d worked harder and studied more (somehow found energy to do more of everything). I’m disappointed in the sites or blog posts from 3 or 5 or 7 years back that have since disappeared. I miss the way the world was, I miss how we engaged with each other, I miss feeling part of it. I don’t really feel like I’m part of anything, these days. So of course I asked a different friend how to deal with regret over past failures, and of course he counselled that forgetting what is behind and striving toward what is ahead generally works best. And so I turned back to today’s reading on Psalm 119 (laboring, as ever, over Oh how I love your law!) and chapters X and XI of Book 1 of Imitation of Christ. We may enjoy abundance of peace if we refrain from busying ourselves with the sayings and doings of others, and things which concern not ourselves. How can he abide long time in peace who occupieth himself with other men’s matters, and with things without himself, and meanwhile payeth little or rare heed to the self within? Blessed are the single-hearted, for they shall have abundance of peace. How came it to pass that many of the Saints were so perfect, so contemplative of Divine things? Because they steadfastly sought to mortify themselves from all worldly desires, and so were enabled to cling with their whole heart to God, and be free and at leisure for the thought of Him. We are too much occupied with our own affections, and too anxious about transitory things. Seldom, too, do we entirely conquer even a single fault, nor are we zealous for daily growth in grace. And so we remain lukewarm and unspiritual. Were we fully watchful of ourselves, and not bound in spirit to outward things, then might we be wise unto salvation, and make progress in Divine contemplation. Our great and grievous stumbling-block is that, not being freed from our affections and desires, we strive not to enter into the perfect way of the Saints. And when even a little trouble befalleth us, too quickly are we cast down, and fly to the world to give us comfort. If we would quit ourselves like men, and strive to stand firm in the battle, then should we see the Lord helping us from Heaven. For He Himself is alway ready to help those who strive and who trust in Him; yea, He provideth for us occasions of striving, to the end that we may win the victory. If we look upon our progress in religion as a progress only in outward observances and forms, our devoutness will soon come to an end. But let us lay the axe to the very root of our life, that, being cleansed from affections, we may possess our souls in peace. If each year should see one fault rooted out from us, we should go quickly on to perfection. But on the contrary, we often feel that we were better and holier in the beginning of our conversion than after many years of profession. Zeal and progress ought to increase day by day; yet now it seemeth a great thing if one is able to retain some portion of his first ardour. If we would put some slight stress on ourselves at the beginning, then afterwards we should be able to do all things with ease and joy. It is a hard thing to break through a habit, and a yet harder thing to go contrary to our own will. Yet if thou overcome not slight and easy obstacles, how shalt thou overcome greater ones? Withstand thy will at the beginning, and unlearn an evil habit, lest it lead thee little by little into worse difficulties. Oh, if thou knewest what peace to thyself thy holy life should bring to thyself, and what joy to others, methinketh thou wouldst be more zealous for spiritual profit. Well. There’s my marching orders. Lay the axe to the very root of our life! Thank God for such pointed words. May He grant it. 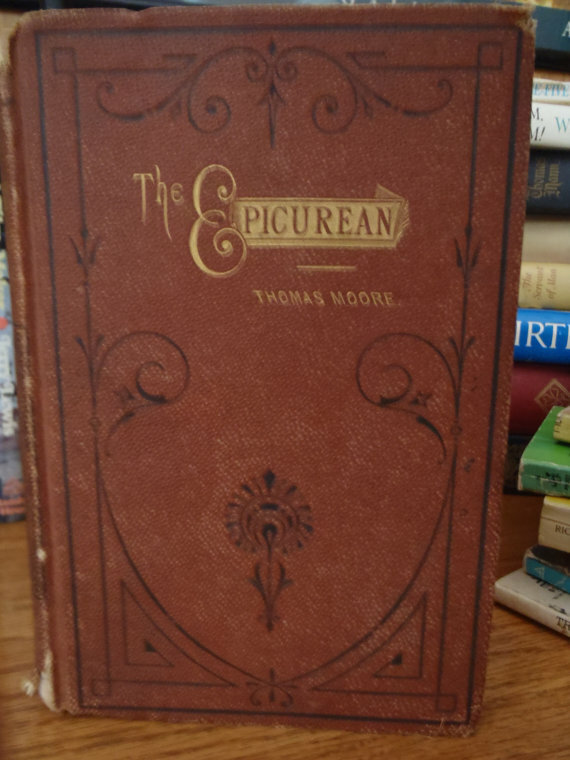 Going off the assumption that there aren’t two prompts in a row for “a book which was better than you expected,” I’m putting on my hipster pants (hahahahaha what a lie) and bringing out a Rather Obscure Book: The Epicurean. This book, not to be confused with Walter Pater’s Marius the Epicurean or Charles Ranhofer’s cookbook of the same name, was written in 1827 by Thomas Moore, not to be confused with the Lord Chancellor and patron of lawyers. Thomas Moore is best remembered as the lyricist who wrote “The Minstrel Boy” and “The Last Rose of Summer,” but he wrote a lot of things, including this story. So saying, this Epicurean falls asleep and dreams of Egypt, and a figure bidding him travel there to find what he wishes for. He makes his arrangements and reaches Alexandria, which welcomes him as a “second Athens.” Thereafter he heads to Memphis, in search of pyramids. Amid festivals and banquets, Alciphron sees a lovely priestess. One night while walking under the moon he spots her again and, retrieving a mirror she dropped, follows her…down steps leading him into a pyramid. The adventures that follow are exciting, but in an old-fashioned sort of way: rather than adrenaline, it all stirs the nerves. The events are thrilling, intriguing, and capture a sort of metaphysical significance which makes them more dreadful. Or terrible, or awe-full: whatever you like. Eventually Alciphron meets Alethe, the priestess, and learns that she is secretly a Christian, attempting to escape the mystery rites. They travel together along the Nile; Alciphron becomes a Christian; and they marry, just as imperial edict begins a persecution of all Christians who do not renounce their faith. The story twines a whole lot of beautiful words around these events, presenting a man of melancholy and his musings on life, death, and what might come after. It isn’t a popular book, but it is a beautiful one.